Siliguri: GNLF leaders have instructed their frontal organisations to launch a campaign over the demand for Sixth Schedule status, to be granted by the Centre, for the hills. The GNWO, the GNLF's women wing, has been asked to hold a meeting in Darjeeling on Tuesday to chalk out their campaign plan. 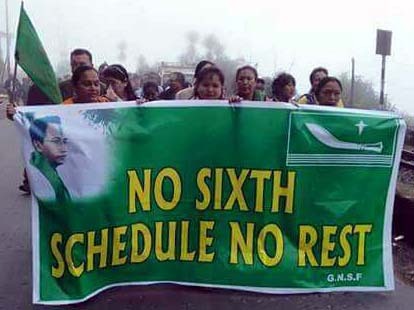 Mann Ghishing, the GNLF president, declared only a week ago that Gorkhaland can be achieved only through the Sixth Schedule. He said so while attending a programme at Rohini in Kurseong. Ghishing had also reiterated the stand before the last round of bipartite talks held with the state at Pintail village here on November 21. "The chief minister formed the Hill Area Development Committee (HADC) after the meeting and appointed Mann as its chairman. This has put him and some other leaders of our party, who are there in the committee, to prove before party workers and supporters that they have not deviated from the principal demand. That is why, a renewed campaign has been planned across the hills and even the frontal organisations have been asked to join in it," said a source in the GNLF. Subash Ghishingh, the founder of the GNLF, was the first to raise the statehood demand and also the demand of Sixth Schedule status for the hills. In the recent months, the split in the leadership of Gorkha Janmukti Morcha and its current silence over the statehood demand has prompted the GNLF to take the opportunity to try and garner support by harping on the Sixth Schedule issue, said observers. "The strike has been withdrawn and the Morcha has not yet taken up fresh political activities over the statehood demand. There has been a split within the party.... the Binay Tamang lobby is working in consonance with the state government while there is hardly any prominent leader of the Bimal Gurung lobby to organise such activities," an observer said. GNLF leaders have instructed their frontal organisations to launch a campaign over the demand for Sixth Schedule status, to be granted by the Centre, for the hills.